Here are the accounts for Ellingham United Charities for the year 2015 to 2016 and 2016 to 2017. (Click on the links below and backspace to return to text.) The land rents have remained the same as the previous year but the investment income has increased slightly 2016, decreased to 2017. The accounts continue to be prepared in such a manner that they are in breach of the 1918 Scheme for the management of the charity. The trustees charged £10 for each page of accounts. 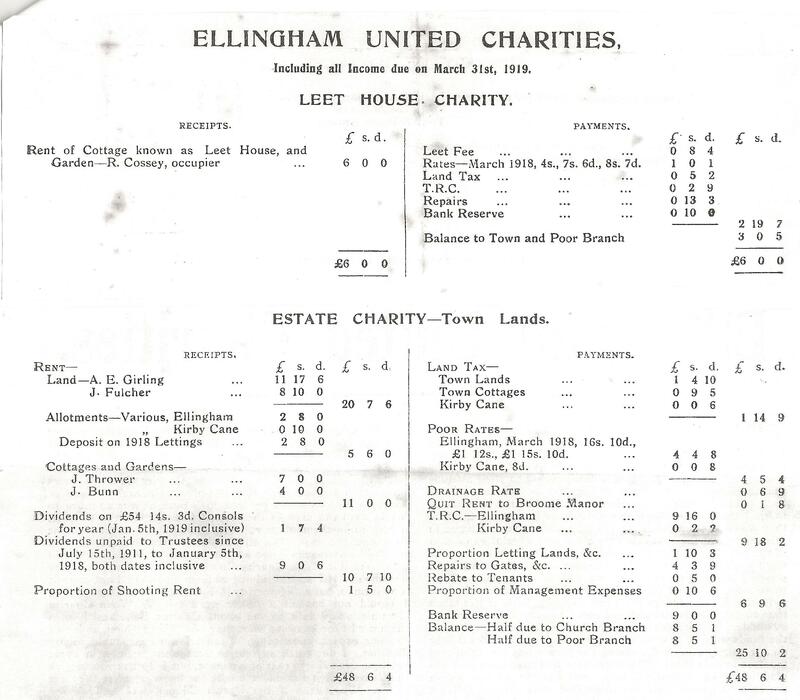 This link above will take you to a copy of the 1918 Scheme of Governance for Ellingham United Charities. There has been a marked improvement in the amount of rent collected for Parish Land known as Ellingham Island (10 acres approx.) from £560 to £900, and for Yarmouth Road (14.9 acres approx.) from £852 to £1200. These rents are now beginning to fall into line with the national average rents for agricultural land. Unfortunately there still remains an anomaly with the rents paid for grazing land. 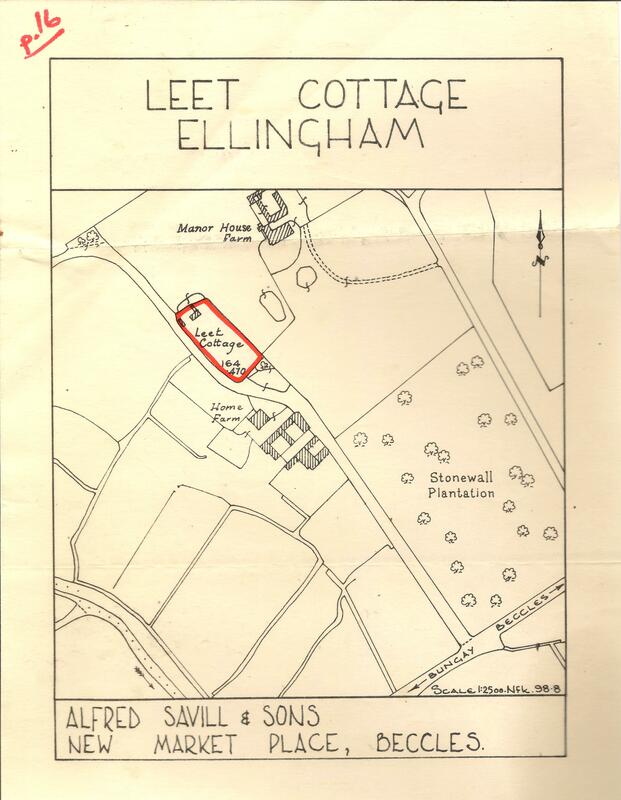 The Ellingham Poor’s Land, known as Butterfly Corner (4.9 acres) and Boons Carr Tidy (14.5 acres), average £52 an acre. These rents have remained static for some time now. Around £85 per acre subsidy is claimed on this land by the farmer who rents it; Savills – Smithsgore report a 28% increase in land rents to 2014; they also report dairy grazing to £102 an acre. It would seem that the trustees could be getting much better value from this Parish Land for the villagers. Perhaps KC&EPC will look into this and ask questions of EUC trustees on behalf of the villagers as, again unfortunately, trustees do continue to hold their meetings in secret. As to outgoings; it is here that an element of discretion is to be expected of the trustees as grants are made to individuals deemed needy within the restrictions of the charity governing documents. However, donations to clubs and societies need not fall within this requirement and it is very good news that EUC trustees have this year provided excellent detail in their accounts. It can only help that the trustees show trust in the villagers in order to gain trust of the villagers. Personally, I would like to see open meetings of the trustees with only the issue of private donations going to closed sessions. EUC Investments: These are funds held in the Charity Commission Coif investment funds (see accounts for details) and gave a return of £2973.20 for the year. My own personal conclusions: Since I have been highlighting the charities over the last few years there have been some major improvements in their management: KC&EPC have appointed trustees, although there is still a question mark over declarations of interest by councillors taking part in that process. Accounts are now being provided with more detail. Income from the Parish Land, which is for local use we shouldn’t forget, is considerably improved. KCC trustees would seem to still wish to withhold information from the villagers and they seem also to be at odds with their governance document. It seems that there are some anomalies with regard to the management of the land rents with such a wide variation of values over some quite similar land. I do feel that there is much more need to involve the villagers in the management of the charities particularly with regard to future developments within the village and the provision of major infrastructure projects. We only need to look as far as Poringland to see how good management of Parish Lands has provided brand new sporting facilities and village hall. We do need KC&EPC to have a bit more vision than village signs and dog bins. It has been said that well managed organisations have transparency, are subject to oversight and are accountable. Unfortunately, none of these apply to either Ellingham United Charities or Kirby Cane Charities which gives us an indication of what to expect in their stories. Whilst the earliest of the charities can be traced back to the fourteenth century, this story starts in the early 1900’s, but there are some general points to be made to set the background to what follows. Parish Councils had been introduced by the Local Government Act of 1894 and Ellingham Parish Council held its first meeting in December of that year. (See Parish Council pages)This Act had the effect of transferring most of the duties that had been carried out previously by the Parochial Church Council to secular authority. Particularly, legal title to the land and assets of all non-eclesiastical charities (that means both Ellingham and Kirby Cane charities) was passed to the new Parish Councils. The horrors of the Great War of 1914-18 saw revolutionary movements across Europe and a gathering force for the enfranchisement of the people, including women. It seems that this new found confidence amongst the ‘middle and lower classes’ is reflected in the dealings between Ellingham Parish Council on the one hand and Ellingham’s Rector and the Charity Commissioners on the other. 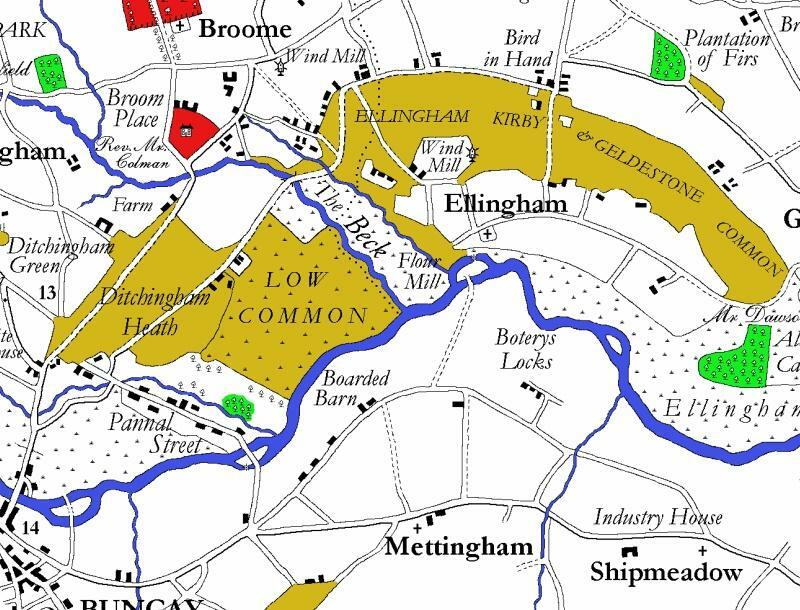 It is very probable that the collective psyche of the ordinary people of Ellingham and Kirby Cane would still be influenced by the events of the early 1800’s, when the local common lands were enclosed by Act of Parliament by the inhabitants of Ellingham Hall and others, including the church. It is interesting to note here that; “All the inhabitants of Geldeston, Ellingham and Stockton had the liberty of Common in Micklefen which stretched from Pewter Hill to Dunburgh. But, as the historian E Thornhill noted: ‘Alas, it has long since been taken from them.’ (Suffolk and Norfolk Magazine, April. 2011). Henry Bonfellow, known also as the Partable Lands. Will dated 1650. John Packard. Will dated 1819. Poor’s Allotment. Enclosure Award dated 1806. These instructions were later sent to the Parish Council as the Charity Commissioners had received no evidence that their instructions had been acted upon by the Rector and Church Wardens; which was perhaps why the Parish Councillors are later seen to become very angry about the way the charities had been managed. Unfortunately, there is no evidence of what the Charity Commissioners replied to these questions, if they bothered to reply at all, as the evidence seen above would seem to suggest. What we do have is a continued refusal of the Parish Council to accept the “1918 Scheme” and a refusal to appoint trustees to the Ellingham United Charities until November 4th 1919. 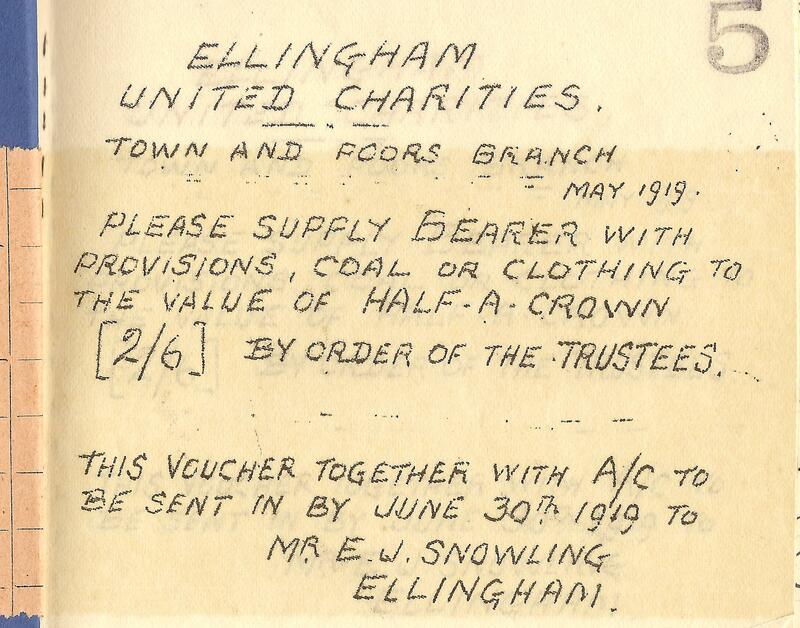 Then Mr L Chapman and Mr J Oldman were appointed for two years as Ellingham United Charities trustees and Mr E Snowling and Mr G F Hinsley for four years. (Parish Council minutes) Again, no written record can be found for this change of heart by the Parish Councillors so we are left to interpret the events for ourselves. However, the following information might help to explain the situation that the Parish Council found itself in. The new Rector, Rev. Hendley, seems to have been very blunt in his dealings with the Parish Council as can be seen in his printed statement; “Why, even if the Parish Council had a treasury overflowing with money to meet heavy law costs, no Court of Law in the land would today grant even permission to appeal against the Scheme. If you don’t believe this all I can say is, don’t wait and see, or even talk and see, but try and see, and then perhaps you will be convinced.” (See appendix 1) He has thrown down the gauntlet; the Parish Council must take on the power and wealth of the church in the law courts if they wish to try to get their voice heard. In 1920 the relationship between the Parish Council and the Rector was sufficiently restored that Rev. Hendley was thanked for presenting the charity accounts to the Parish Council. 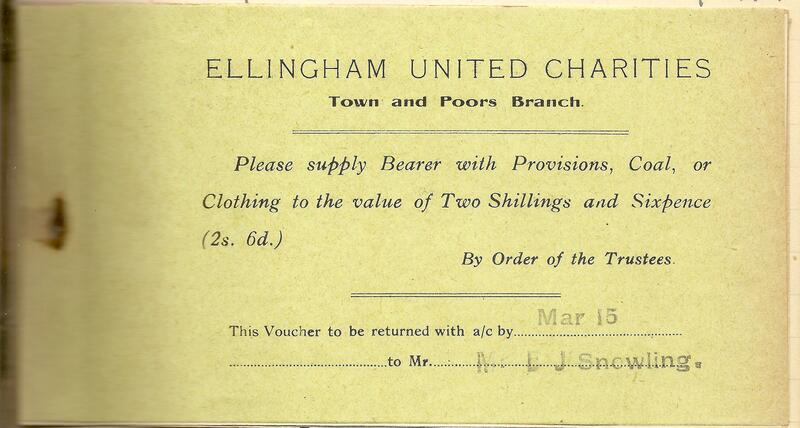 However, it seems that relations never thawed out enough for the matter of the Ellingham United Charities 1918 Scheme of Management to be ratified by the Parish Council. Despite the Charity Commissioners lack of evidence that any monies from the charities be diverted to church use, provision was made in the Scheme for some funds to be used for such purpose. (What these amounts are can be seen in Appendix 3.) Furthermore, the Charity Commissioners, out of the blue so to speak, made it a condition that the Rector and the Lords of the Manors of Stockton with the Soke and Ellingham Nevells be the three “ex-officio” trustees of the charities. The Parish Council though did have the advantage of appointing four “representative” trustees so gaining a majority voice in the management of the charities. From the 1920’s onwards there is evidence from the records of both the Ellingham United Charities minute books and the Parish Council minute books for the involvement of the Parish Council in appointing trustees and receiving the accounts of the charities. In fact, the evidence from the trustee’s accounts book shows the annual accounts being audited by the four Parish Council representative trustees from 1920 until 1936. ** However, very controversially some would say, up to the present day there seems to be no attempt to distinguish between the management of the charities in terms of appointing trustees for each of them. This, it can be seen in the charity records, has led to the accounts of the charities becoming muddled over many, many years. This in turn has led to monies being alloted wrongly. 1. The Church Branch, to be managed by the Rector and churchwardens of Ellingham. 2. The Town and Poor’s Branch, to be managed by the Rector, the two Lords of the Manor’s of Ellingham Nevells and Stockton with the Soke and four Representative Trustees appointed by the Parish Council. Now, as the Church Branch of the Ellingham Charities had no legitimate (by the findings of the Charity Commissioners themselves) charitable funds to call on, the (previously called) Town Lands were identified by the Charity Commissioners and Rector for this purpose. A good choice for them as this is the charity which dates back to the fourteenth century and seems to have been amongst some of the papers/parchments missing at that time. With the exception of a property known as Leet House, there were some twenty-odd acres of arable land and two further cottages which were now to be called “The Estate Charity”. The net returns from the renting out of this land and property would be divided into two parts; half going to the Church Branch and half to the Town and Poor’s Branch. 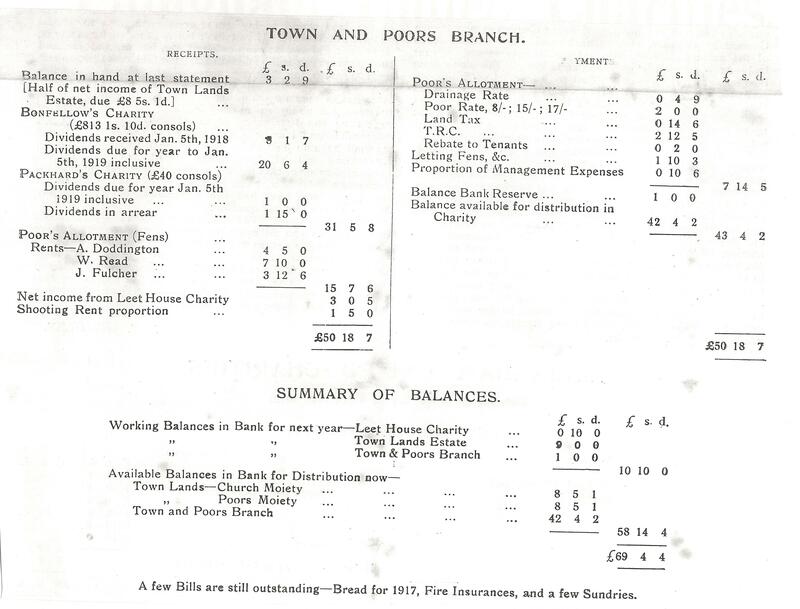 The Estate Charity would be managed by the trustees of the Church Branch and the Town and Poor’s Branch acting together with the addition of the (two) occupiers of the Estate property. Now back to the story; at the very first meeting of the Ellingham United Charities held under the provisions of the new Scheme on December 10th 1918, there was present the Rector and four others who were signed in as trustees. Of the four others; one was L. Col. H L Smith Lord of the Manor of Ellingham Nevells, another was a Mr H J Sprake, Attorney to John Kerrich, Lord of the Manor of Stockton with the Soke; and the other two, E J Snowling and D Barber, who were churchwardens. These people now proceeded to manage the Ellingham Charities, despite this being contrary to the management conditions set out in the “Scheme”. This left the Rector and the Lord of the Manor of Ellingham Nevells as the only two people present at that meeting who were in fact entitled to manage the Ellingham Charity and the Town and Poor’s Charity. As the quorum for a meeting is four for the Estate and three for the Town and Poor’s, no meeting should have taken place at all. Remembering that the churchwardens are only entitled to be at the Church Branch meetings. The Rector and these others carry on in this manner until January 1920 when the first Parish Council representatives arrive at the trustees meeting. The actual extent of the problems surrounding these first meetings, in that the Rules of the Charity Commissioners Schemes were ignored, can be seen by studying the document in Appendix 1. It seems that there had not been a single appointed Parish Council Representative Trustee involved in the management of the Ellingham Charities for many years. This despite the “1918 Scheme” stating quite clearly that the trustees should notify the Clerk or Chair to the Parish Council immediately of any such vacancies. Obviously, the Parish Council is also responsible for failing to attend to its duties of management of these village assets. This, having been brought to the attention of the Parish Council, is now rectified and there are now four appointed Representative Trustees from May 2012. However, even though there was plenty of evidence for muddled accounting by these self same trustees, as well as the trustees re-appointing themselves, the then Parish Council voted the same trustees in en bloc. It also needs pointing out here that some of the councillors did have vested interests in the charities. So it was then, that only the Rector was rightfully a trustee of the Town and Poor’s charity for many years. This is not in any way to question the integrity of our past fellow villagers, our neighbours in time, nor the present trustees who did not question past practice and many mistakes that had been made. This is merely to present the evidence so that past mistakes may not be repeated in the future. What of Mr Sprake the Attorney who had been, despite Charity Commissioners rules to the contrary, standing in as a trustee for the Lord of the Manor of Stockton with Soke? Soon after the appointment of the Parish Council trustees in 1919, Mr Sprake presented the trustees with a bill for £6.15s.0d for his services to the trustees. This is recorded in the minutes, March 29th 1921; “Mr Sprake’s bill gave rise to considerable discussion, much of the eloquence being rather beside the mark.” Reverend Hendley wanted to pay the bill, but eventually agreed to check with the Charity Commissioners first. The trustees finally agreed to pay the bill in June 1921 (Charity Minute Book) but not without further “considerable discussion” and a split vote; four in favour, Reverend Hendley, Col. Smith, Mr Snowling and Mr Barber and two against, Mr Oldman and Mr Hinsley. The vote is interesting for, as we have seen, Mr Barber was not legally a trustee. Mr Snowling, who was by now serving as Parish Council appointed trustee was also a Churchwarden and perhaps had torn loyalties at this point. Regardless of these points however, to pay the bill was wholly against the Charity Commissioners rules as laid out at that time and since. From around 1935 Col. Smith is no longer present at any of the trustees meetings and, as the Lord of the Manor of Stockton with the Soke was still absent, this left the trustee’s management in the hands of the Rector and the four Parish Council representatives. However, the minute book continues to show the presence of extra bodies at meetings throughout the next fifty-odd years. So much for the “1918 Scheme” and the conditions for management of the Ellingham United Charities set out therein. In 1933 a piece of land was set aside for Mr Whinns (?) for the; “…setting up a cycle repair garage and petrol pump.” (Ellingham United Charities minute book) This seems to be the land at Crossways that was later sold in the 1950’s in two pieces, the proceeds being £37.10.0 and £200.0.0., these funds were invested by the Charity Commissioners in the trustees desired fund of 3.5 % War Stock. (ibid August 1955) Further land at Crossways was sold in 1982 for the sum of £3,000 to Mr Penfold and the trustees agreed that the proceeds should be invested in the Charities Official Investment Fund. “The Estate Charity now held 5648.76 shares.” (ibid October 1982) There were some problems with this sale later on when in 1986 the Beccles Congregation of Jehovah’s Witnesses wanted to build on the site. The Ellingham Rector, Rev. Roger Blankley, protested strongly to the Department of the Environment that the land was sold on the understanding that there would be no development. Rev. Blankley went on to point out that the villages of Ellingham and Kirby Cane were already well supplied with two parish churches and a Methodist church and had no need of a Kingdom Hall. Land was sold to Norfolk County Council (three very small sections) for minor road improvements in 1946; compulsory purchase. The £10 raised from the sale of this land was invested in War Bonds according to the Ellingham United Charities minutes October 11th 1946. This, by the way, is the only mention of war at all in the minutes although the charity account books do show a “War damage contribution…£1.7s.7d.” from 1940 to 1944. By 1968 the property held by the Leet House Charity was; “…unoccupied and in poor condition…” and advice was given that it should be sold at auction with a reserve price of £500. (Alfred Savills letter 6th April 1968 and Appendix 5) The property was sold by auction at the King’s Head in Beccles on 14th June 1968 for £1,650. After expenses were paid the proceeds of £1,539 were invested by the Charity Commission in 6.75 % Treasury Stock. The TownLand cottages 1 and 2 Station Road were sold at auction on 26th June 1970 for the princely sum of £3,700. The upkeep of these properties had been a problem to the trustees for some time, having to be “…made presentable and fit for habitation…” in 1937, (Ellingham United Charities minute book, November 1937) and they had become very dilapidated again. The proceeds of the sale were invested with the Charity Commissioners Official Investment Funds. Land was compulsory purchased from the Ellingham United Charities in 2002 by Norfolk County Council for the building of the Ellingham and Broome bypass for the sum of £580 net. The value of Consols in the Estate Branch is £54. From a position of a portfolio worth around sixteen times more than the Estate Branch portfolio in 1918, the Town Branch portfolio is today worth seven and a half times less. This raises questions about; why is this so? Whilst Property from both Branches has been sold, perhaps not so much as to create such a vast difference in the values of each of the Branch portfolios. Why is this of any importance? Well it is a matter of distribution of funds; the Town and Poor’s funds go directly to the people of Ellingham, whilst half of the Estate funds go to the Parochial Church Council. The first distribution of charity funds, under the 1918 Scheme, was made in 1919. Four trustees were present; Reverend Hendley, Lt. Col. Smith, Mr Sprake and Mr Snowling. (As seen above, they were acting outside the conditions set by the 1918 Scheme, with only Rev. Hendley and Lt Col. Smith being entitled to be there.) Fifty-one names had been drawn up to receive the fund distribution and tickets had been made worth two shillings and sixpence each. 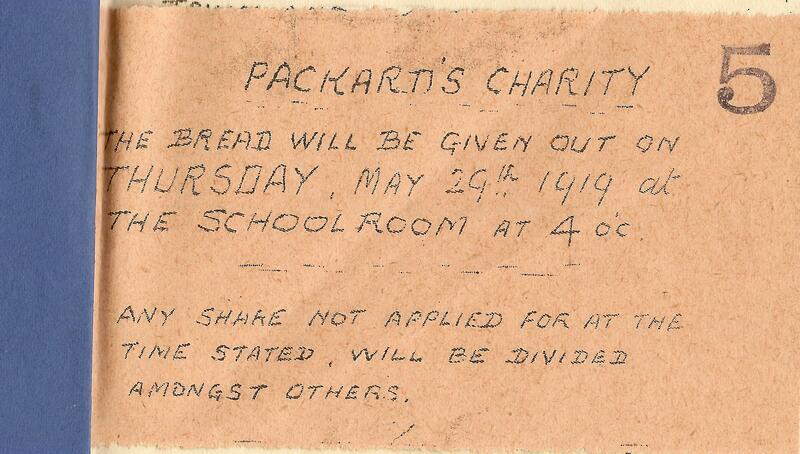 Bread, given out by the terms of the Packard Charity, had to be collected from the school room on Thursday May 29th 1919 at 4 o’clock. (See Appendices 2 and 4) There were no niceties given in those days about keeping the distributions secret! The names of the recipients are all listed in the minute book. The number had risen to fifty-three in 1920. The upkeep of the TownLand properties was not the only problem for the trustees; in 1930 a complaint was received from one of the occupants about their neighbour; “…neighbours were greatly annoyed and upset at the vile language used by the woman housekeeper…” (Ellingham United Charities minute book, November 1930) The Rector explained what he had done and that there had been no further complaints. However, a year later, the trustees are taking steps to remove the tenant, Mr Brown, unless he put a stop to the bad language. (ibid 1931) At this same latter meeting, after a complaint that the dealings of the trustees were being discussed around the village, the Reverend Hendley pointed out that the trustees were not pledged to secrecy and that villagers could question the trustees at the Annual Parish Meeting. In April 1940 the trustees met in the Church Hall for the first time. A curious entry appears in the Ellingham United Charities minute book in August 1955; “The Chairman spoke of the damage done to the life belt, and it was agreed that steps should be taken to have it recovered.” Were the trustees involved at the river in some way? Whatever the case, the trustee’s accounts book (1956) shows that the repairs cost £2.3s. In 1968 the trustees begin their first deliberations about letting the land that had been used as allotments be transferred to a “…representative body…” for the use of a playing field. This body was the Parish Council and it is clear from the minutes of both the trustees and the Parish Council at this time that there was a strong wish for the project to go ahead and succeed. At this November 1968 meeting the trustees paid tribute to “…the late…” Mr Hinsley. This seems to be the same Mr Hinsley who had been one of the first Parish Council representatives. The natural gas pipeline going through Ellingham is mentioned in the minutes of 1969 as it passes through the charity land. The £195 way leave money was invested. In the 1980’s the trustees were taking a greater interest in the village assets held by the charities and for the first time since 1918 asked questions about the investments of the charities. At that time, October 1985, the holdings in the Charity Commissioners Official Investment Funds were; Town and Poor’s £2,208 and the Estate £16,833. There was also a move to find out exactly where the lands managed by the charitywere and how they were let. For example, it seems that the shooting rights over the land were being sub-let at that time. There is perhaps a firm lesson for current and future Parish Councils in the minutes of Ellingham United Charities, 16th September 1986. The Parish Council had written to the trustees with some suggestions; “1. The gratuity made to the secretary should be revised to a more realistic figure. 2 All rental charges should be revised and rents brought up to present day levels. 3. At future Parish Council meetings the Trustees should put before the Council a report of current activities.” Very reasonable suggestions it might be thought, but the response of the trustees was rather short and cutting; [the trustees] “…felt that the Council had no power to make these suggestions or in any way control what the trustees did. Mrs Mitchell was to write and point this out to them.” (Ellingham United Charities minutes 16th September 1986) Two points can be made here; first of all, who are these trustees? It seems that only one is a Parish Council appointee. The second point to make is that the 1918 Scheme, as has been seen above, makes the provision for a majority of the trustees to be Parish Councillor Representatives. It seems that the failure of the Parish Council to attend to their responsibilities in the election of representatives has led here in 1986 to the trustees taking powers of management unto themselves. The Parish Council responded by resolving at their meeting of 10th November 1986 to; “…close the correspondence, but to recommend future Councillors to ensure that acting Parish Councillors are elected as Representative Trustees.” Sure enough, at the next Annual Parish meeting 16th July 1987, the one Parish Council trustee was confirmed and three more appointed. From then on until recent times United Charities reports were given to the Annual Parish meetings. What of the Sand and Gravel Charity? This is a small parcel of land on the boundary between Ellingham and Geldeston and in 1986 the sum of £105 was granted for the planting of trees on that site. It seems, through the Parish Council minute books, that the Parish Council has been responsible for the charity and in 1989 resolved that all Parish Councillors would be trustees for the Sand and Gravel charity throughout their terms of office. This was notified to the Charity Commissioners and the Rural Community Council. Parish Council minutes for 1991 also show that the charity was still in the care of the council. However, by 2011 the Sand and Gravel Charity becomes pretty much lost in the records. 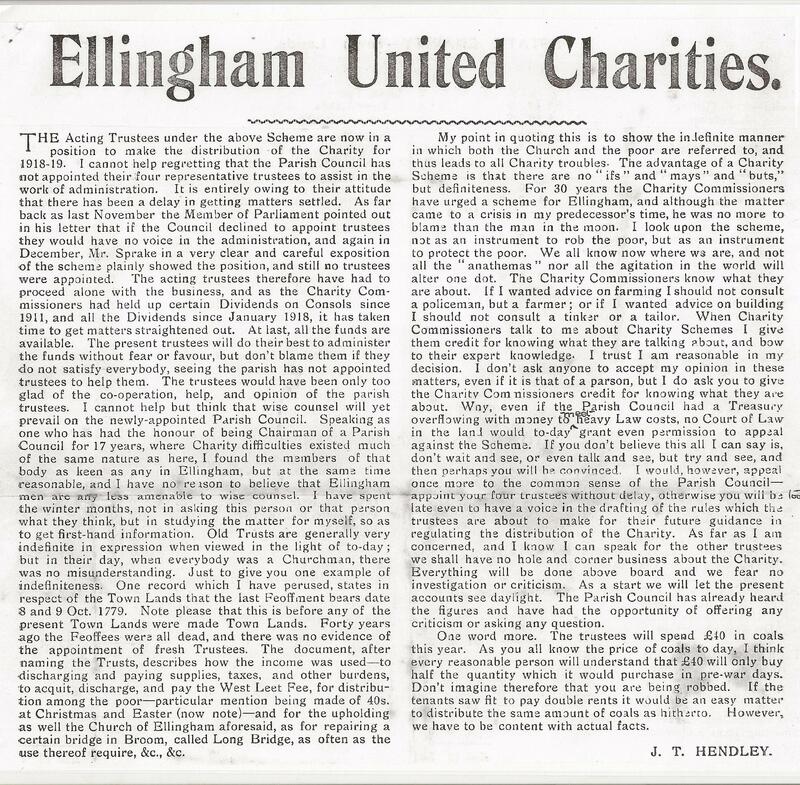 Now re-established, (after the author’s research), the Parish Council decided to pass the management of the charity to the trustees of Ellingham United Charities; strange you might think, but it is important to link this with the wholesale resignations from the Parish Council shortly after that.. In the 1970’s the Ellingham United Charity trustees can be seen to be donating towards the playing field, the play group, All Hallows hospital and school visits. Regardless of the nature of these good causes, no mention is made from which charity the funds are to be used, nor is reference back to the 1918 Scheme conditions which might allow or disallow these donations to be made. In 1977 £50 is given to a school building project; in 1983 £150 for a strimmer for the church; in 1984 £200 for repairing the church wall; in 1986 £100 for school books; in 1987 £200 for church hall renovation, £100 to the school, £100 to the bowls club. 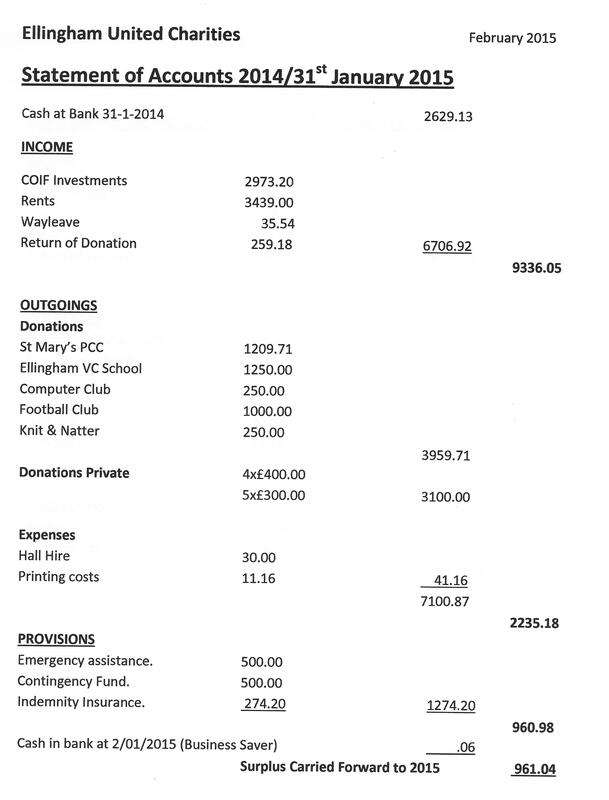 The report of the Ellingham United Charity accounts to the November 2000 meeting of the Parish Council mentions “approx. £400 given to the school.” Similar payments continue to be made by the trustees up to the present day with a £1,500 donation to the Ellingham Parochial Church Council in the 2010/11 accounts. No mention is made of clearing these payments with the Charity Commissioners, or declaring by which Clause of the 1918 Scheme they have been made. ** Without separation of these financial transactions in the minutes it is not possible to tell whether or not these payments are within the 1918 Scheme conditions. The Church Branch, whether or not there is agreement about the propriety of this charity as the aggrieved Parish Councillors of the early 1900’s would contend, is instructed to spend its income solely for the upkeep of the church property one way or another. The conditions laid out in the 1918 Scheme for the Town and Poor’s spending are rather more non-specific, but do disbar areas that are provided for by the “rates”. 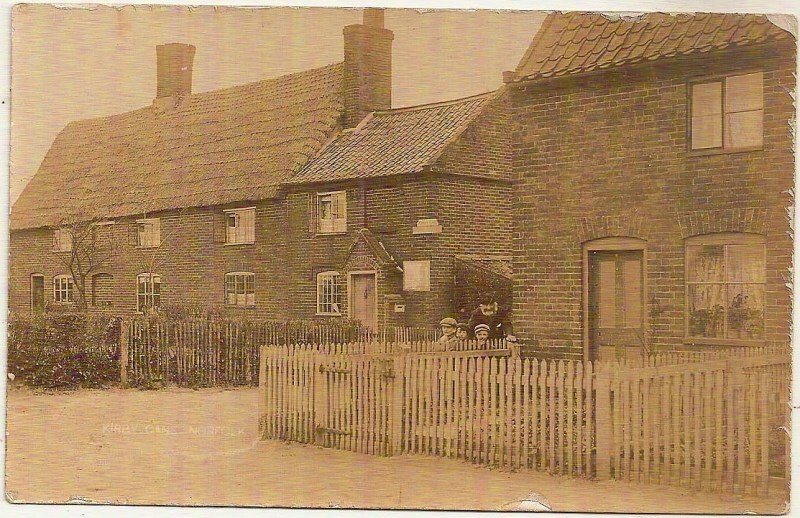 What is very certain from this look at the history of the Ellingham United Charities from 1900 onwards is that there have been long periods when the importance of these major village assets seems to have become lost to most villagers. Indeed, they had become lost to the Parish Council, not for the first time, for several years up to 2012. This does seem to be rather unfortunate when such valuable assets and investments are involved. Bearing in mind that the village is expanding and that there are pressures to provide much more building land, the fact that charity land occupies prime positions should perhaps exercise some minds. Agricutural land reaches £10,000 to £12,000 and acre; building land can reach into millions. There is now agreement that there should have been separate accounting procedures for each of the Estate Charity, Town and Poor’s Branch and Church Branch. There is agreement that the Parish Council should appoint four of the trustees, but had failed to do so for several years. There is agreement that no trustee should have been renting land belonging to the charity. There is agreement that it is only the income from the Estate Charity assets that should be divided 50/50 between the Church Branch and the Town and Poor’s Branch. The Town and Poor’s Branch keeps all of its income for distribution to those in need; individuals or organisations. There is agreement that the trustees became muddled in their accounting procedures. That the Estate Charity owes money to the Town and Poor’s for the decades of mismanagement by trustees who appointed themselves; basically they acted illegally! That the trustees should not have taken £1,500 from the Town and Poor’s Branch to subsidise the repair of the church roof in 2010/11. Villagers are allowed to become connected with these village assets and decide how best they might be employed for the future benefit of the village as a whole. The land and investments of the charities belongs to the village as a result of legislation, Enclosure Acts and Local Government Acts, and should legally be held by the Parish Council. You might have thoughts of your own or other ideas to add. You can make these known through attendance at Parish Council meetings and by offering to become a trustee of the charities. Here (Appendix 2) is an update (May 2014) about the land rented to local farmers by the trustees: European subsidies have been claimed on all of this land at around £85 per acre whilst the rents have been set by the trustees at less than £60 an acre. A clear profit before any farming is done at all. The local MP has described this as fraud; it would seem an apt description. There are around 67 acres of land belonging to the parishes of Kirby Cane and Ellingham; this is Parish Land. This land is managed by the trustees of two charities; Ellingham United Charities (EUC) and Kirby Cane Charity (KCC). The land described on the Enclosure Award map – a legal document – as Poor’s Allotment, is not charity land. In 1894, when the Local Government Act came into force, all non-ecclesiastical charity assets became the legal interest of the new Parish Councils. Therefore the Parish Council, on behalf of the villagers, is the legal guardian of all the aforementioned lands and investments pertaining thereto. All of the land belonging to the parishes, except the Playing Field and the Allotments down Newgate Lane, has been rented out to local tenants. These tenants have been claiming EU Single Farm Payment subsidies on this Parish Land. This subsidy for 2012-13 was £85 an acre and is normally paid to the landowner. If paid to the tenant, independent research shows that rents would increase accordingly. These tenants were paying rents in 2012-13 that average out, for KCC and EUC managed land, at around £58 per acre compared with £85 per acre subsidy being claimed! Only on one piece of land is any rent paid above the level of subsidy. We should remember that this is just for one year. This practice has been going on since 2005; ten years; tens of thousands of pounds! Who should be claiming this subsidy? When the new system of farm subsidies was introduced in 2005, it was a subsidy given to look after the land rather than, as previously, to support livestock or particular crops. Research shows that it is more normal for the land owner to claim the subsidy as it is an environmental payment to look after the land. In other words, it should be the Parish Council, as holders of the legal interest in the land, which should be claiming the subsidy on behalf of the villagers on the Poor’s Allotments. Whilst the trustees of EUC and KCC should be claiming the subsidy on behalf of the villagers, as trustees of Parish Land given as charity. In 2004-5 EUC were receiving a total income of £1,744 from tenants on the Parish Land. In 2012-13 the income was £2,416, about the rate of inflation and around £53 per acre. A very cheap rent and absolutely no reflection of EU subsidy at £85 an acre. In EU Single Farm Payment subsidies alone this EUC trustee’s managed Parish Land attracted £3,850 as a minimum in 2012-13. Would any sensible landowner give up their right to claim this subsidy whilst charging a rent significantly lower than the subsidy? 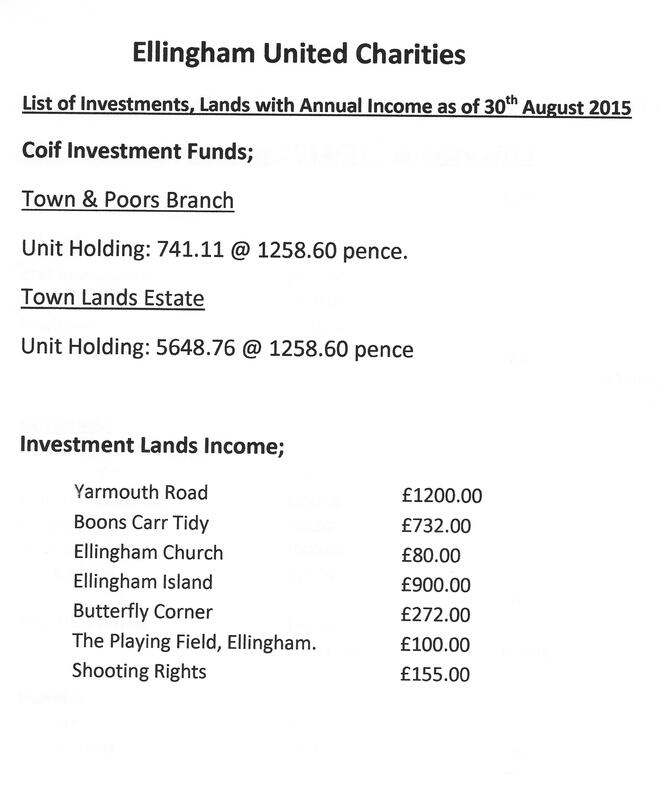 So over the ten years of this type of EU subsidy huge sums of money have been involved; at 2012-13 prices around £38,500 on Parish Land in Ellingham alone. That is without taking fair land rents into account and a similar situation that exists with KCC trustee’s managed lands. Certainly the Charity Commissioners cannot be relied upon to gain the necessary changes. They have been aware of the mismanagement for years and have failed miserably to do anything. Note: Whilst the Charity Commissioners have written to the MP Mr Richard Bacon, and others, to say that they are “satisfied” that they need not be involved with EUC procedures; within days they were writing to the trustees of EUC warning them that they had “breached” the charity trust document for years and could face regulatory action and be held “personally” responsible for any losses that occurred! A formal complaint to the Parliamentary and Health Service Ombudsman is being lodged against the Charity Commissioners for their handling of these two charities. Kirby Cane and Ellingham Parish Council (KC&EPC) seem to want to bury their heads in the sand and to pretend that this situation does not exist. However, as KC&EPC has over the past few years been made fully aware of what has been going on with regard to Parish Land, this stance could be seen as an act of wilful blindness. Furthermore, KC&EPC have failed for many years past to keep the External Auditor fully informed about the assets of the parishes. An investigation by the External Auditor has been experienced by an employee of the council and fees of around £9,000 were charged. This is an enormous cost to the ratepayers just because KC&EPC and trustees of EUC and KCC will not apply due diligence to their duties, comply with the law and protect the village assets. The Rural Payments Agency who give out the EU subsidy says; “The Rural Payments Agency is reluctant to get drawn into disputes between landlord and tenant or competing occupiers of land. Its normal response to disputes about whether land is at a claimant’s disposal is to delay payments until such time as the parties have resolved the dispute amongst themselves.” However, it can be reported here that the Rural Payments Fraud Team are now looking into these matters. We might ask therefore; why doesn’t KC&EPC try to resolve matters too? The villagers have lost tens of thousands of pounds over past decades because nobody has taken control of the situation; a charity became lost; trustees have appointed themselves time after time; trustees have rented out land to a fellow trustee at very favourable rents; monies have been taken from the Poor’s Land rents and placed into church accounts; monies have been misappropriated, monies badly needed by local deserving organisations have been left sitting in accounts, investments and accounts have been allowed to become so muddled that it is now difficult to know which investment belongs to which branch of the charity. Isn’t it time that the body(s) locally responsible took long overdue, corrective action in the best interests of the villagers? The most recent (June 2014) documents received by me via a Freedom of Information request to the Charity Commissioners give cause for yet more serious concerns about both the Charity Commissioners and the trustee’s management of EUC. Therefore, please treat this as a new complaint against the Charity Commissioners. I will copy to the MP Mr Richard Bacon and to the trustees. I will also copy to the Parish Council as they appoint the majority of the trustees to this charity. The utmost good faith is required of anyone aspiring to be a Trustee. A high degree of probity, honesty, and integrity are required in undertaking to ensure the fulfillment of the Trust. Trustees must not allow a conflict of interest to develop between themselves and the Trust,to do so is a breach of trust. Serious wrongdoing by charity trustees and others to include: Trustees or others gaining personally from the charity through deliberate or reckless acts carried out in breach of trust including the misappropriation of charity property and the receipt of unauthorised benefit from the charity. Trustees recklessly making very poor decisions in circumstances in which they are not properly advised, or informed or take irrelevant factors into account which result in significant losses to the charity. Keeping this guidance and promises from the Charity Commissioners regarding Breaches of Trust in mind; what has been the actual course of action taken by them in the case of continual Breaches of Trust by the trustees of EUC? The trustees did Breach Trust for over a decade by failing to make sure that trustees were appointed correctly by the appointing organisation. The trustees did Breach Trust by failing to implement Clause 39 of the Scheme of Governance: 39. Trustees not to be personally interested. No Trustee shall take or hold any interest in property belonging to the Charities otherwise than as a Trustee for the purposes thereof, and no Trustee shall receive any remuneration, or be interested in the supply of work or goods, at the cost of the Charities. Land has been rented to one of the trustees for many years past. The trustees have failed for decades to keep accounts according to the trust document/Scheme of Governance. This Breach of Trust continues to this day. (See Appendix 6) The Scheme requires the trustees to keep separate accounts for the Town and Lands and the Town and Poor. It is a requirement that the donations and expenses of each of these be kept separate. The PCC is very restricted to the amount of money it can take from the Town and Lands branch of the EUC; the accounts are meaningless in this respect. It is a requirement that members of the public be able to see the financial position of either of these branches of EUC at any time; this is refused by the trustees with Charity Commissioners support. The Charity Commissioners continue to allow a breach of their own rules and the requirements of the 2011 Act of Parliament. There are many examples of Breach of Trust by way of misappropriation of EUC funds which went on for decades, as can be seen in the accounts held in the Norfolk Record Office, right up to the present day. The Breaches of Trust committed by the trustees of EUC involve many thousands of pounds. The people of Ellingham could justifiably ask; WHAT IS THE POINT OF THE CHARITY COMMISSION? The Breach of Trust relating to Clause 39 of the EUC Scheme of Governance, mentioned above, was recognised as “valid” by the Charity Commissioners over two years ago. In February 2014, after two years of waiting for the EUC trustees to act, they finally issued a warning that the Breach of Trust must be rectified. The trustees, determined to continue as before, instead have asked for, and been given IN SECRET, a new Scheme that will allow the Breach of Trust to be legalised. Furthermore, the trustees have been given, it seems, by the Charity Commissioners immunity from any further action to recover the thousands of pounds lost to the villagers through their mismanagement. There has been a Police investigation of two councillors; one was told to apologise to the Parish Council for failing to declare an interest in charity affairs. The other person eventually resigned from the council. We have seen the resignation of the Parish Council Chairman, the Vice Chairman and eventually all of the councillors bar one; all connected with the mismanagement of the charities. The present appointed council has been unable to quieten matters down at all. WHY HAVEN’T THEY BEEN CONSULTED AS IS REQUIRED BY THE CHARITY COMMISSIONERS OWN RULES? WHY HAVE THESE CHANGES BEEN MADE IN SECRET? WHAT IS THE POINT OF THE CHARITY COMMISSION IF IT ALLOWS BREACHES OF TRUST AND HUGE LOSSES OF INCOME TO GO UNCHALLENGED? I have asked time and again for the Charity Commissioners to mount an investigation into these Breaches of Trust, but to no avail. It has only through continual requests via Freedom of Information legislation that many of the Breaches of Trust listed here have been discovered. EUC themselves have spent thousands of pounds of charity income on legal fees given to their own, Diocesan, solicitor in order to protect themselves. They have all the time continued to act in secret, never consulting the people of the village, or their representatives via the Parish Council.